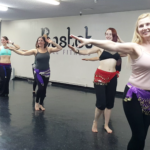 This slower paced class is excellent for those who are new to the art of bellydancing, as well as for those students who want to review Middle Eastern Dance techniques like body rolls, shimmies and hip undulations. Come explore the fundamentals of belly dancing in a fun encouraging environment! The first half of class will consist of a warm up, in-depth movement and technique breakdown, instruction on isolations, traveling steps, body awareness and simple layering. In the second half of class you will learn a fun choreographed dance routine utilizing movements and techniques learned in class. Each routine is taught over a four week period but drop-in’s are welcome at any time! All fitness and experience levels are welcome! We recommend students wear workout attire and bring a water bottle. 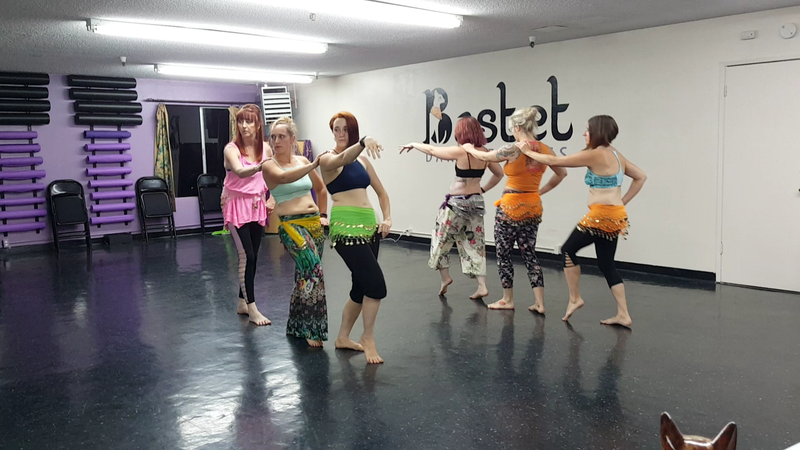 This intermediate level class is excellent for those who want to take their bellydancing to the next level! Building on movements and techniques learned in the beginning class we will learn more complicated techniques and layerings. Build your strength, stamina and confidence with engaging combos and drills. Class will consist of a warmup, technique breakdown and drills, a dance routine or combos and a cool down. Drop-in’s are welcome at any time! While all levels are welcome, this is not a beginning class. 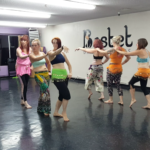 Beginning Bellydance is recommended for those new to bellydance.